Struga, the hometown of the Miladinovci brothers, is situated along the Ohrid Lake. 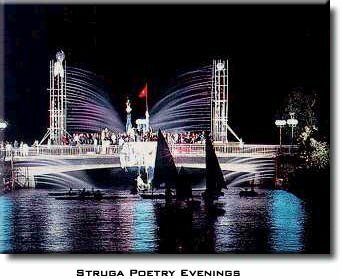 In honor of Miladinov brothers, here, since 1962, in the month of August, every year, a poetic manifestation has been held under the name Struga Poetry Evenings. In the framework of Struga Poetry Evenings, central part is given to the Symposium where current theoretical issues from the literature are discussed. Besides the Symposium, which is under the aegis of UNESCO, there is so called traditional evening on which various world literature are presented. Every year, two highly important acknowledgments are conferred on this festival: Miladinovci brothers acknowledgment for best poetic work and Golden Wreath for poetic opus of the most eminent writers of the world literature.